Training & Events – Paul Michael Raspa, Jr.
Paul offers training programs and participates in various events in Central Texas and across the country. Hello! 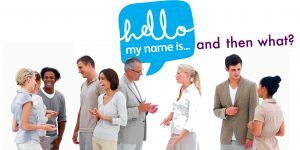 My Name Is… And Then What? How do you get into a conversation with a total stranger? Have you opted out of a networking event because you don’t know what to say? How do you get people to share the information you desire? Your business requires a consistent pipeline of prospects, leads, and customers. But sometimes getting into first-time conversations with someone can be intimidating, even paralyzing. It doesn’t have to be painful! In fact, it can be fun. Paul’s self-mastery and business coaching will be recognized by the Austin LGBT Chamber of Commerce with a ribbon cutting at their monthly luncheon. As a straight ally, LGBT business owners are one of the many communities Paul serves in Austin and beyond. Nikken empowers people to live healthy by choice through active wellness products. Paul will be one of the presenters for the Nikken Advantage Saturday event in South Austin. Caregiver Cafe is a not-for-profit organization supporting individuals who offer in-home caregiving for a family member such as a chronically ill spouse or child. Paul will be offering a workshop of self-care as part of this day long event.